The timely and disturbing “Gyre: The Plastic Ocean” has traveled from the Anchorage Museum with an art warning about something called a “gyre.” Although the mind immediately leaps to “Turning and turning in the widening gyre,” the message in this case is not from Yeats but from the sea. The Pacific Ocean churns between the Asian coast and the American coast in what is termed the North Pacific Gyre and here, in the heart of the ocean, the Great Garbage Patch is swirling endlessly. For years, artists have been attracted to this growing ecological disaster of waste and abandonment, an unintended consequence of a consumer culture. Presenting an assemblage of shopping bags, Dianna Cohen sums up the source of the garbage problem—I shop, I throw away. The next stage of the process of acquisition and discard is taken up by Edward Burtynsky, who photographed the vast vista of a Chinese dumpsite of apparently sorted items waiting for recycling. Four of the artists in the exhibition — Mark Dion, Pam Longobardi, Andy Hughes and Karen Larsen — joined the project in order to personally view the vast wasteland and collect evidence of cultural misdemeanors. 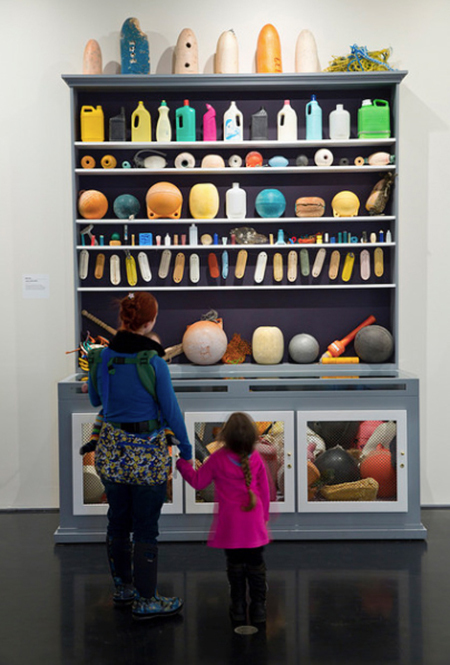 Dion, who is well known for his “Cabinets of Curiosities,” put together a depressing display of ordinary household cleansing containers and other quotidian objects that are, in fact, destroying our ocean and threatening all who depend upon its health. Larsen placed large mason jars on a set of bleached wooden shelves in what appears to be a decorator’s solution to a blank wall. But these aqua tinged jars contain whitened bits and pieces of plastic, the size that kills fish and chokes seabirds. Although there is an educational tone to the exhibit of work by socially active artists, the exhibition should be thought of as evidence of suicide: we are killing ourselves.